King County Councilmember Dave Upthegrove said the moratorium, if approved, "sends a clear message that, moving forward, King County is going to support clean energy technologies rather than fossil fuel." King County Councilmember Dave Upthegrove plans to introduce on Monday a six-month moratorium on building or expanding major fossil-fuel facilities in King County. The ordinance would also direct the county executive’s office to produce a study of fossil-fuel facilities in King County, their impacts on communities, and the permits and regulations that apply to them. Then, the council could look at lasting changes. “We’re going to hopefully put the moratorium in place and then go through that lengthy legislative process to look at — what will the actual language be in various sections of county code?” Upthegrove said. The moratorium ordinance does not apply to gas stations or other fossil-fuel products sold directly to consumers. King County is limited in its ability to regulate fossil-fuel facilities, Upthegrove said. The ordinance applies only to unincorporated King County. It does not disallow existing infrastructure or directly address rail lines or pipelines, which are regulated by the federal government, not the county. County staff have not identified any proposed projects that would be directly affected by the moratorium. Instead, the measure targets zoning and permitting for possible future storage facilities, processing facilities or compressor stations — “things that aren’t specifically a rail line or pipeline, but are part of that network that would deliver fossil fuels into the market,” as Upthegrove put it. The moratorium will likely see a vote Monday, after its introduction. The idea for the ordinance came from the climate activism group, 350 Seattle, and is modeled after similar legislation in Portland, Tacoma, and other cities. 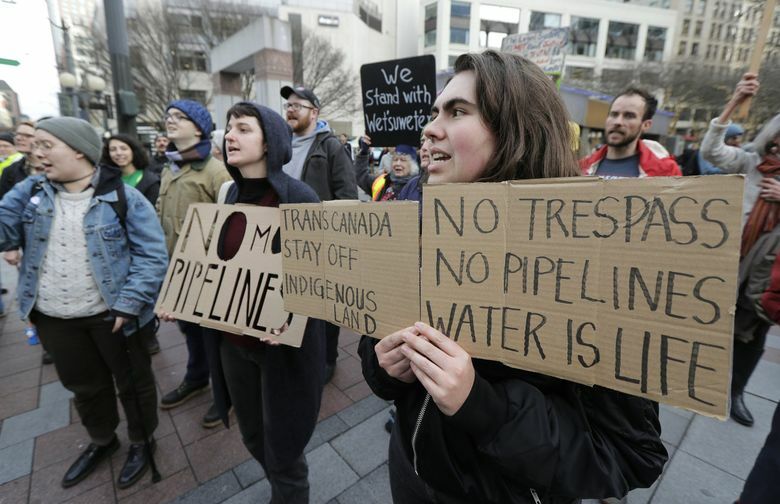 Jess Wallach, an organizer for 350 Seattle, said climate advocacy organizations hope to build a patchwork of Northwest communities with similar bans on fossil-fuel facility construction, limiting the industry’s ability to expand capacity. Gas infrastructure poses health and environmental risks to communities, Wallach said. If King County passes this moratorium, organizers believe cities within the county will follow with similar measures. Organizers hope local measures to limit pipeline infrastructure could curb gas supply to future industrial projects. If constructed, the proposed Kalama methanol plant in Cowlitz County would use huge amounts of pipeline-delivered natural gas from British Columbia to produce methanol to ship to China for plastics manufacturing. Wallach’s group worries the project will boost gas demand and could spur pipeline construction or expansion. Dan Kirschner, Executive Director of the Northwest Gas Association, said he viewed a possible moratorium as unnecessary, shortsighted and potentially counterproductive in achieving carbon-reduction goals. Without the Kalama plant, Kirschner said “methanol will be built or processed through coal-based facilities” abroad, and have a larger impact on global emissions than if produced here with natural gas. A recent report concluded that building the Kalama plant could help reduce global greenhouse gas emissions, but some argue the study underestimated potential leaks of heat-trapping methane and overshot the plant’s potential impact on China. Another analysis said the Kalama plant could actually increase overall greenhouse gas emissions.